Russia’s ties with some GCC states like Qatar and Saudi Arabia have suffered since the Syrian conflict began, but they are steadily climbing back from the trough. The host country, Kuwait, has given a big curtain raiser to the forthcoming Gulf-Russian Strategic Dialogue at the foreign-minister level, which is scheduled to take place on coming Tuesday. Moscow has not yet spoken. The Kuwaiti official mentioned Syria amongst the topics that will come up for discussion between Russian Foreign Minister Sergey Lavrov and his counterparts from Bahrain, Kuwait, Oman, Qatar, Saudi Arabia and the United Arab Emirates. It will be a gross simplification to say Russia and the GCC states do not see eye to eye on the Syrian situation. The differences are many and even fundamental if one were to take into account the agenda of ‘regime change’ that the US and its allies have been pursuing with regard to Syria. But then, arguably, that is not stopping Russian diplomacy from casting its net wide and Moscow talking to even Syrian National Coalition, which some of the GCC states support financially, materially and politically. The meeting in Kuwait is taking place despite the lack of progress at the Geneva 2 conference, as openly acknowledged earlier this week by the UN-Arab League mediator Lakhdar Brahimi. Equally, Russia has found it “absolutely unacceptable” that the United States and its allies have chosen this delicate juncture to moot a resolution on Syria at the United Nations Security Council ostensibly calling for the lifting of all siege in Syria so as to facilitate unhindered delivery of humanitarian aid, but with a cutting edge containing an ultimatum for the government of President Al-Assad. Indeed, diplomacy is at its best when it is about carving on tiny pieces of ivory, and Lavrov is not going to let pass any opportunity that comes his way to persuade the “other” side to do a bit of rethink about the wisdom of persisting with the course that they have been keeping so far in Syria. If something good comes out of the cogitation, it can only be for the good, but nothing is lost anyway. On the other hand, two positive things must also be noted. First, Russian diplomacy appears to have succeeded in repairing whatever setbacks there would have been to its ties with the GCC states as a result of the fury let loose by the Syrian conflict through the past 3-year period. Unsurprisingly, Russia’s ties with some GCC states suffered in this period – especially, Qatar and Saudi Arabia – but they are steadily climbing back from the trough. This facilitates a candid exchange of views regarding what lies ahead for Syria. 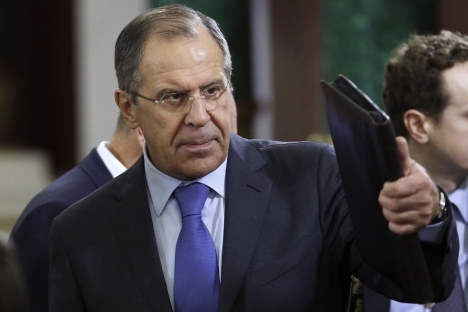 Secondly, Lavrov with his well-honed diplomatic skills will surely take measure of the cross currents of regional politics in the Persian Gulf when a huge upheaval is sweeping through the Middle East. As far as the Persian Gulf is concerned, the situation around Iran will be of particular interest. Russia has lately consolidated its strategic understanding with Iran and the expected visit of President Vladimir Putin to Tehran promises to be a milestone. Meanwhile, the relations between Iran and the GCC states are also moving toward a reset. However, on top of everyone’s mind at the moment is the royal decree issued by King Abdullah of Saudi Arabia on February 3 imposing prison terms of 3-20 years on Saudis who abroad to fight for ‘jihad’. There is huge speculation already in the western media about the import of the Saudi decree – principally, as to whether Saudi Arabia is shifting its policy towards Syria. Regionally, of course, theories are a galore – including that the United States held a pistol to the Saudi temple and demanded that Riyadh jettisoned its nefarious support for radical Islamist groups, which in turn left Riyadh no option but to make a clean break with the past. Of course, nothing can be brusquely dismissed as nonsensical when it comes to Arab politics, where facts often may get embellished and appear stranger than fiction but nonetheless remain new reality to be reckoned with. Indeed, US president Barack Obama is heading for Saudi Arabia late March and there have been hints he may hold a Gulf Arab summit while on the visit. Indeed, things may not be as simple as Saudi Arabia taking fright following an American ultimatum, but there is all the same reason to believe that something could indeed be happening by way of a major rethink in Riyadh on the foreign policy front for a variety of good reasons, the most glaring being that Saudi regional policies in Iraq, Syria and Lebanon are in a cul-de-sac. Suffice to, when a senior Iranian diplomat stationed in a key regional capital like Beirut has chosen to publicly commend upon last week’s Saudi decree, it merits attention. Beirut is not like any other capital. It is a city where the Saudi and Iranian pathways crisscross and often sparks do fly. It is the city of heart’s desires for the Hezbollah in whose rise Iran had played a seminal role. The Iranian Ambassador to Lebanon Ghazanfar Roknabadi has said, “[We are seeing a] start of change in Saudi Arabia’s foreign policy.” And he proceeded to take note of it as the basis for a Saudi-Iranian rapprochement in a near future. “Reaching the state of a Saudi-Iranian rapprochement will not take long. God willing, we will reach that stage soon,” he added. Of course, diplomats by nature are expected to be optimistic people but even then, what Roknabadi said can only be reflective of a careful assessment made in Tehran about the Saudi royal decree some ten days ago. If the Iranian assessment of Saudi Arabia is spot on – and it had better be – then, the next week’s GCC-Russia Strategic Dialogue will be taking place in a rather dramatic regional setting. Which is probably what Jarallah hinted by way of underscoring the “great hopes” on all sides regarding the meet. To be sure, Lavrov will take the bounding pulse of his GCC interlocutors. But the gifted diplomat that he is, Lavrov may not also stop at that.